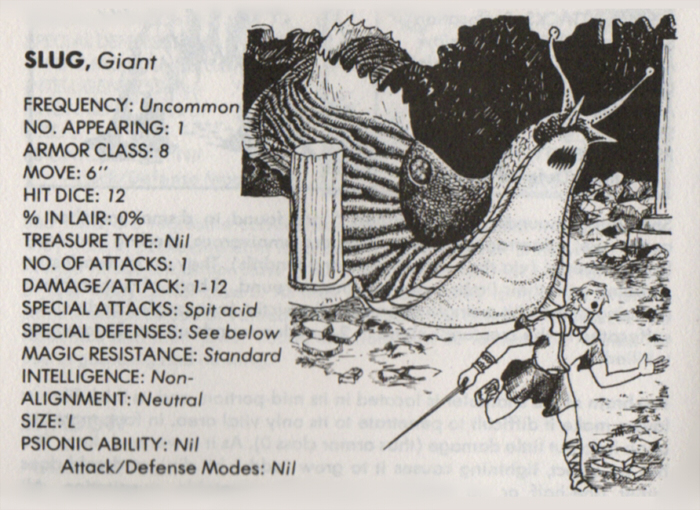 My infatuation with Dungeons and Dragons actually began before I'd ever even heard those two words together, having acquired a bendable rubber Carrion Crawler at a very young age. Plastic Rust Monsters and Bulettes would also enter my possession, as did stickers and temporary tattoos of various weirdos like the Stirge, Mind Flayer and Beholder. These mysterious figures were among the first fantasy beasts to ever capture my imagination, but I'd yet to learn that they all shared the same wonderful world. Everything clicked into place one day on a visit to my grandmother's house. Knowing how much I loved monsters, she'd happened upon a book chock-full of them at a thrift store and thought I might enjoy it. As a matter of fact, I positively flipped for it. 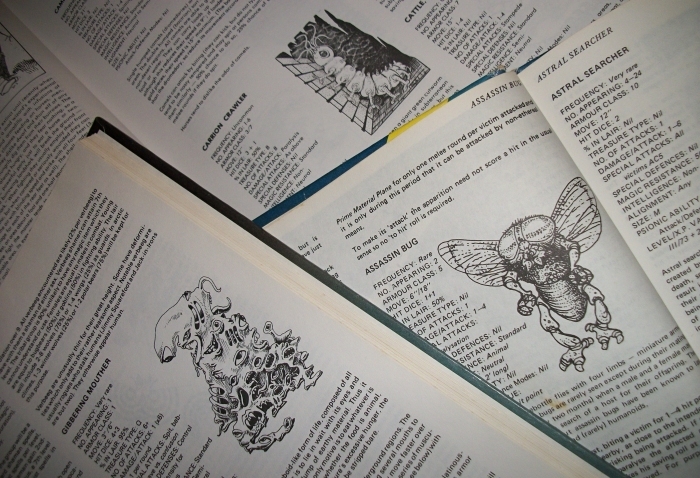 Only around half a decade old, I had never before seen an entire encyclopedic text detailing the habits of giant insects, predatory slimes and floating, magical eyeballs, nor did I expect to find over a dozen of my favorite creatures collected in the same fantastical tome. I only vaguely understood that this was all somehow part of a strange, complex game played by grown-ups, and many of the game-specific terms were meaningless gibberish to my young mind, but there were days I pored over its contents from breakfast to bedtime. I took it everywhere I went, reading and re-reading my favorite entries. I made adults read to me about Black Puddings and Brain Moles as I drifted off to dreams of Thought-eaters and Gelatinous cubes. I drew Ankhegs and Otyughs lurking deep in treasure-lined caverns. I crafted pages of my own with all-original monsters and variatons on existing monsters, even giving them stats whose functions I still grasped only poorly. Dungeons and Dragons had introduced me to the concept of serious world building. 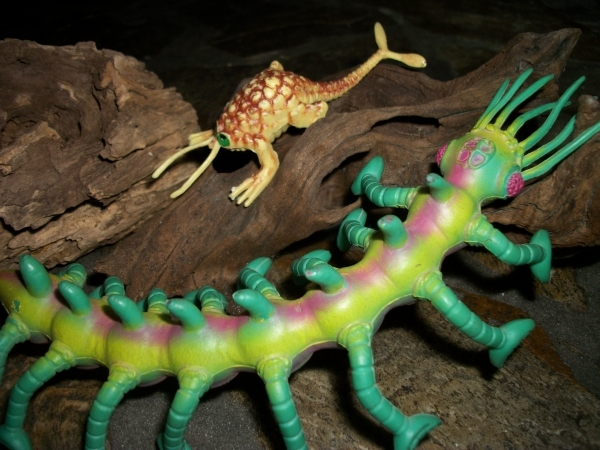 It had shown me that a monster is more than a cool drawing with a name and a few powers, but interacts with the setting it inhabits in the same way that real species form entire interconnected ecosystems. It had sparked something not unlike the Cambrian explosion in my childhood imagination, and to this day, one can probably trace every half-decent idea in my artwork back to that special day on my Grandmother's living room floor. 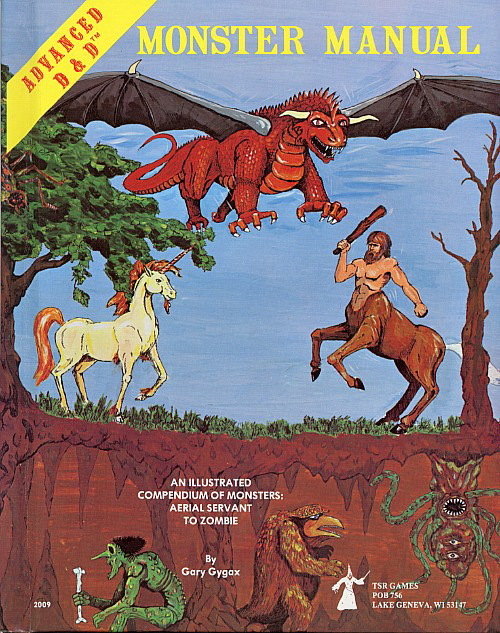 As the years passed, I discovered the farther reaches of the D&D bestiary. My first encounter with the Fiend Folio was like unearthing some secret, long-lost sequel to the bible. When I grew older, I'd spend entire afternoons at the long gone Bibelot or Waldenbooks reading through the Monstrous Compendiums for various settings; the fierce desert insects of the Dark Sun world, the mind-bending cosmic horrors of Planescape. I had no friends who would have ever been interested in actually playing the game, and in my pre-internet life, little means of learning more without tracking down the books myself. I would finally get to play a bit of Dungeons & Dragons around my mid-twenties, but that's probably a story for another time. My appreciation for Lurkers, Gorbels and Ustilagors goes above and beyond the game itself; deep in my heart, the game is an optional accessory to the monsters. Click below to browse my individual reviews of Dungeons and Dragons creatures, which I will continue to add here from time to time!